CGA is a holistic assessment of older people, with a plan for addressing any needs. It has been used by geriatricians for many years, and has recently become part of the assessment of oncology patients in some centres. In this article, these questions are addressed: What is CGA, who performs it, and why should oncologists know about it? Despite the importance of improving management in this group, older people are under-represented in most cancer trials.5 They are also less likely to receive all types of standard cancer therapies compared to younger people.6 Possible explanations for this include medical decisions around the risk of adverse effects, patient preferences, comorbidities, or access to treatment. Ageism has also been suggested, and there is evidence that some oncologists base their treatment choices on age rather than other factors.7 But age is a poor assessment tool for judging fitness in older people. It is a surrogate marker for comorbidity among the population, but utilising this method to decide who gets treatment does not take into account individual factors. For example, one patient aged 80 might be very frail with multiple comorbidities and be expected to live less than a year. However another may be very fit, with no active disease, and have a likely survival of 15 years or more. The capacity to tolerate cancer therapy is likely to be markedly different in both these 80 year olds. An ‘end of bed’ assessment will not take into account all relevant factors when making this decision. Indeed some patients who look very fit have underlying frailty and will require a modified treatment regimen. It is for this reason that comprehensive assessment is recommended. Older people can be described as “fit”, “frail” or “vulnerable” depending on their overall condition. When an older adult is diagnosed with cancer, it is important to perform a full assessment to inform shared decision making. This process is called “Comprehensive Geriatric Assessment” or CGA and involves a multidisciplinary multi-domain assessment – see Figure 1. Functional status: refers to a patient’s ability to perform their activities of daily living. This is easily assessed using one of several standardised scales such as Activities of Daily Living (ADL) and Instrumental Activities of Daily Living (IADL) scales, or the Barthel Scale. Functional impairment is more common in older people who have cancer than those who do not. Overall survival has been shown to be associated with level of independence in older people with advanced non-small cell lung cancer receiving chemotherapy.10 In addition the risk of toxicity is higher in those who are more functionally impaired. Nutritional status: weight loss is an independent prognostic factor for survival in cancer patients.12 It can be easily measured and monitored throughout treatment. Several scales exist to screen for malnutrition such as the MNA (Mini Nutritional Assessment). 3 and 25% of older people with cancer.13The psychological demands of cancer can mean that older people with the condition are particularly vulnerable, and need extra support. Medication review: in patients being actively treated with chemotherapy it is important to review medications as interactions can be very harmful. Equally, in patients whose life expectancy is limited it is in their best interests to stop medications such as statins, osteoporosis treatment, and sometimes medications such as antihypertensives or diuretics. The Beers criteria, or Screening Tool of Older Person’s Prescriptions [STOPP] can be helpful. Environment review: it is common for older people to be living in accommodation that does not meet their changing needs. Performing a home visit helps to assess for hazards that increase falls risk, as well as allowing to plan for aids that may be necessary as functional impairment increases. This may include equipment, monitoring or care visits. Although it may be possible for one person to assess all the domains in a CGA, it is most usefully performed as a multi-disciplinary assessment. This usually involves a physician with experience of CGA such as a geriatrician or GP, physiotherapist, occupational therapist, specialist nurse and sometimes others such as pharmacist, speech and language therapist or social worker. The process can be time-consuming and resource intensive but is necessary to assess all possible needs. Screening tools have been created, such as the G8, but none have been shown to predict the outcome of CGA and so it remains the gold standard. 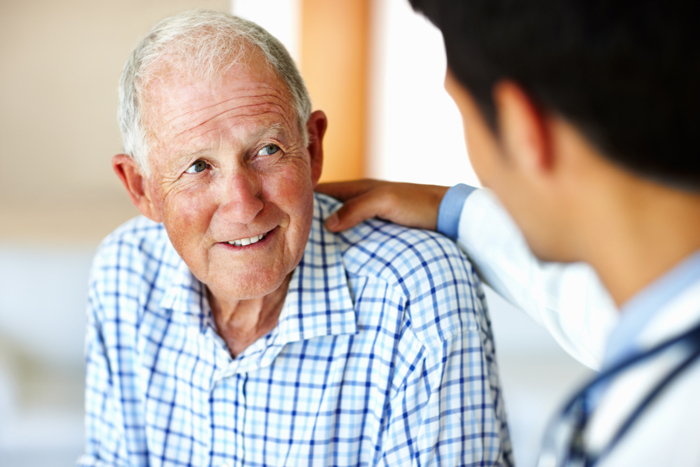 A very important component of the CGA is an assessment of a patient’s functional abilities and their social support. In older people, symptoms from their cancer or from its treatment can include fatigue, reduced mobility, impaired cognition, nausea, poor appetite and weight loss. The result of this can be unexpected difficulty in performing activities of daily living. Independence can be adversely affected, and care needs can be significantly increased. This is why an assessment at baseline is useful; so that if things change, then appropriate interventions can be provided. These commonly include equipment such as mobility aids, a raised toilet seat, a commode, grip handles or modifications to the home such as a walk-in shower, downstairs living or a stair-lift. Referral to social services may be needed to trigger a package of care or financial support. Other practical considerations include organising transport to hospital appointments or ensuring that social isolation is reduced by linking with volunteer support groups. There are often concerns that older people will not tolerate treatment, but in fact many do. Fisher assessed the uptake and tolerance of chemotherapy in older patients with small cell lung cancer.16 Of patients who were recommended chemotherapy by their oncologist, 81% began treatment. 52% of those treated completed all planned cycles, with 34% of the treatment group receiving reduced doses. Patients who completed chemotherapy had significantly better survival than those who did not, even when the dose was reduced. In order to facilitate appropriate treatment, chemotherapy risk prediction tools have been developed (such as the CRASH score, or CARG tool) that have been validated in this group. These can help to clarify the balance of risk and benefit. Similarly, surgery is under-used in older people and there is a steep decline in the rates of cancer surgery as age increases. After an individual assessment, all appropriate treatment options should be considered. Because older patients have been under-represented in clinical trials, there is still a lack of evidence to show efficacy for some therapies. A pragmatic approach is therefore often needed. CGA provides a vital insight into the needs of the older person with cancer. It helps to identify previous unknown conditions and issues, and can be used to create a management plan to optimise patients in advance of their cancer treatment. Quaglia, A., Tavilla, A., Shack, L. The cancer survival gap between elderly and middle-aged patients in Europe is widening. European Journal of Cancer, 45, 1006-1016. Hutchins LF, Unger JM, Crowley JJ, Coltman CA Jr, Albain KS. Underrepresentation of patients 65 years of age or older in cancer-treatment trials. N Engl J Med. 1999;341(27):2061. Hurria A, Leung D, Trainor K, Borgen P, Norton L, Hudis C. Factors influencing treatment patterns of breast cancer patients age 75 and older. Crit Rev Oncol Hematol. 2003;46(2):121. 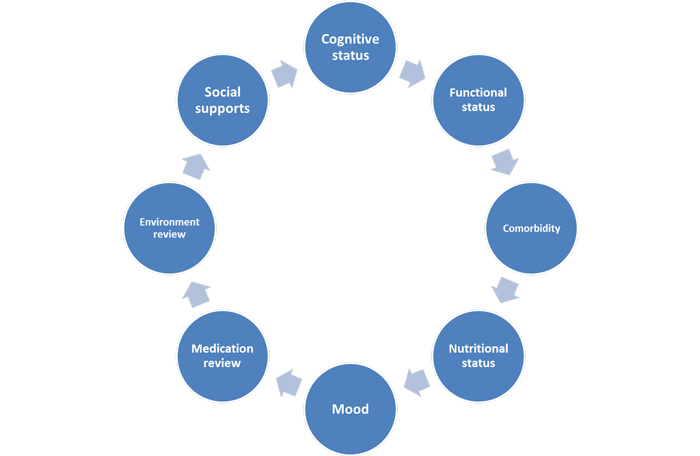 Hamaker ME, Prins MC, Stauder R. The relevance of a geriatric assessment for elderly patients with a haematological malignancy–a systematic review. Leuk Res 2014; 38:275. Maione P, Perrone F, Gallo C, et al. Pretreatment quality of life and functional status assessment significantly predict survival of elderly patients with advanced non-small-cell lung cancer receiving chemotherapy: a prognostic analysis of the multicenter Italian lung cancer in the elderly study. J Clin Oncol 2005; 23:6865. Hines RB, Chatla C, Bumpers HL, et al. Predictive capacity of three comorbidity indices in estimating mortality after surgery for colon cancer. J Clin Oncol 2009; 27:4339. Dewys WD, Begg C, Lavin PT, et al. Prognostic effect of weight loss prior to chemotherapy in cancer patients. Eastern Cooperative Oncology Group. Am J Med 1980; 69:491. Kua J. The prevalence of psychological and psychiatric sequelae of cancer in the elderly – how much do we know? Ann Acad Med Singapore 2005; 34:250. Seeman TE, Berkman LF, Kohout F, et al. Intercommunity variations in the association between social ties and mortality in the elderly. A comparative analysis of three communities. Ann Epidemiol 1993; 3:325. Gupta SK, Lamont EB. Patterns of presentation, diagnosis, and treatment in older patients with colon cancer and comorbid dementia. J Am Geriatr Soc 2004; 52:1681.